It’s been more than a year since we last spoke on the phone. That’s my fault. Last time you called me and after a lengthy conversation I then promised to call you. But I let working hard in California (and my distaste for email) leave a silence all this time. I apologize for that. You have been an important part of my life for thirty years. And you still are. Last time we spoke we did some reminiscing about how we became friends through the music. During the 1980s I was with A&M records managing sales and distribution from Los Angeles, and as part of that responsibility I was the liaison with Windham Hill, which is how we met. You were helping Windham Hill Records develop some new artists, and together we found that our musical tastes weren’t too dissimilar. After Windham Hill, you worked with RCA Records, creating the Novus series, and we reunited when I joined BMG in 1990 and moved to the east coast, working (like you) in New York City. Besides, it wasn’t like we didn’t speak during our individual transitions as our friendship was way beyond a business association. And I was pleased that we’d be working together, again. When I moved, in 1996, to Universal Music to manage GRP/Impulse Records, we once again shared ideas on projects, artists, musicians, and writers, where you contributed as a consultant and independent producer. It was you who directed me toward Impulse recording artist Michael Brecker, a musician whose music and reputation I knew, but a musician I had not yet had the pleasure of meeting. We had a mutual respect for other artists on the label, including Eric Reed, Diana Krall, Danilo Perez, Horace Silver, McCoy Tyner, and so many more. Your relationship with independent producer Michael Cuscuna and members of John Coltrane’s family contributed to some of our most amazing reissues and as importantly, our most amazing dinner conversations. The Live at Smalls project, though I’m sorry to say not embraced by some at GRP/Impulse, was a wonderful example of your ability to generate ideas on working with new, young talent. Your friendship eased my first days, weeks, and months at GRP/Impulse, helping me get to know the artists, and transitioning into my new job in New York. You told me to trust people like Hollis King whose creative touch helped redefine the artwork for the Impulse, GRP, Commodore (and other) recordings we released. You, knowingly or not, provided the imprimatur that helped make the difficult job of turning GRP around a little easier. Away from the office you have always been a rational sounding board to help clarify (or properly identify) the wheat and the chaff. You never suffered fools from those within the music industry or in daily life itself and your clarity was welcome. Our shared lunches, dinners, bottles of wine, (oh those bottles of wine) and concert performances we enjoyed together are vivid memories. 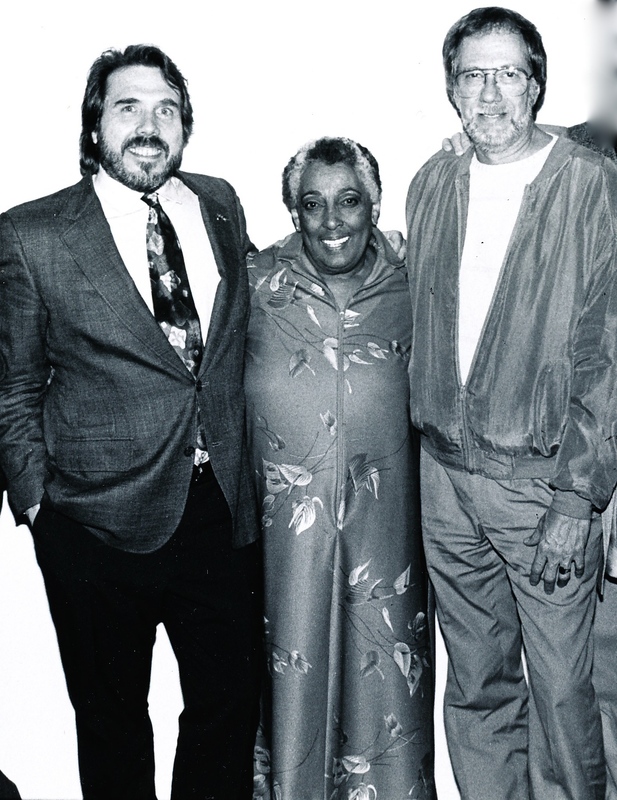 A favorite photograph I’ve kept since it was taken more than 20 years ago shows us backstage after a performance by Carmen McRae. The accolades you’ve received over the years have been the perfect musical bed to drown out the noise from the occasional “colleague” with whom you could, would, and did disagree. Shortcuts and corner-cutting were never strategic options for you. Each artist you signed, each recording you made, each reissue you helped bring back to the public was treated with respect and dignity. For you, quality on all fronts wasn’t a sometimes thing. It was a necessary component of the process. Artistry has been an all-encompassing concept, and part of your mantra. The dignity of the artist is not to be lost in the process as long as you are in charge. I received an email from Gail Boyd recently alerting me to an article about you in the New York Times. The article was titled, somewhat mysteriously, “Steve Backer, a Force for Jazz at Major Labels, Dies at 76”. Why would they profile your wonderful career and then apply that title to the piece? The Times has been wrong before and I can only assume that some other guy named Steve Backer died and they didn’t check the facts. You may or may not know this or acknowledge this but you’re a legend in our music community. Our lives have traveled somewhat parallel paths (although I’m not legendary), as we spent a decade or more working at other companies before finally meeting in the 1980s. I’m just glad our lives did, in fact, cross. The music has been as central to your life as it has been to mine. Let’s clear this other thing up. You’re not dead. Your here, with all of us right now. Your music continues to play on. And what you’ve contributed to all of the lives you’ve touched is not some amorphous, ephemeral thing. It’s tangible, real, valuable, and not to be casually discarded. You’ve made a difference and I’m pissed off that anyone could actually think you’ve gone and died. Until I see you again, consider suing the Times; then once this dead thing is straightened out, let’s meet for a great bottle of wine, at one of our favorite spots in Manhattan. We’ll reminisce, laugh, shed a tear or two, and toast the music.